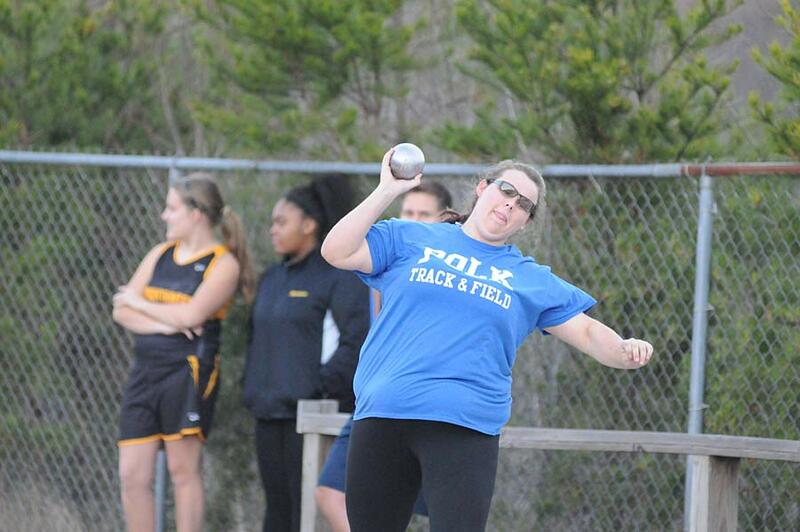 Polk County’s Michaela Nelon set a school record in the shot put Friday to lead the Wolverines at the 2016 Visit Winston-Salem Mini Meet, held at JDL Fast Track in Winston-Salem. Nelon won the event with a throw of 33-7 3/4, topping the previous indoor school mark of 32-5 set in 2012 by Charlyn Bullock. Nelon had already broken the record on her third attempt, a 32-7 throw, before winning the event with her final throw of the evening. Teammate Tameeia Brown placed fifth in the event. Nelon was the only Polk County event winner at the meet, dominated by the Burlington Cummings women and Green Hope men. Cummings scored 98 points to easily outdistance Pinecrest, which finished with 49 points. Polk County’s girls placed seventh out of 22 schools with 29 points. Green Hope piled up 106 points, finishing well ahead of runner-up Millbrook with 54 points. Polk County placed 12th out of 29 teams with 17 points. 1. Michaela Nelon 33-7.75; 5. Tameeia Brown, 30-7.75; 10. Maggie Silvers, 24-5.25.